The GHG emission reductions registry provides a transparent and credible registered listing of projects that reduce intensity based carbon footprints. It lists each project as well as issues and tracks each metric tonne of Greenhouse Gas reduced or removed. All listings and issuances go through a rigorous process to ensure all the standards requirements are meet and the singularity of reductions (i.e. credits have not been previously issued or sold). Credits receive a unique reference number (Serial Number) and are tracked through their entire life-cycle, via registered transfers that define the volume, serial number and vintage transferred to a new recipient. Retired reductions are permanently "locked" by the registry, ensuring that reductions cannot be re-issued, sold or transferred at any time. The objective of any voluntary GHG project is to have actual intensity based reductions that cause a lowered Greenhouse Gas Emission profile due to an operational change or process that is demonstrably better than sectorial and site practice standards. All projects must be able to demonstrate that the project is Additional, whereby the emissions from the project activity are lower than alternative or typical scenarios, careful consideration must be taken to ensure that registered projects can factually demonstrate that the "Emission Trajectory" of a project is better than the business as usual (BAU)approach. Assessing and documenting causality of emission reductions is a cornerstone to all GHG projects. 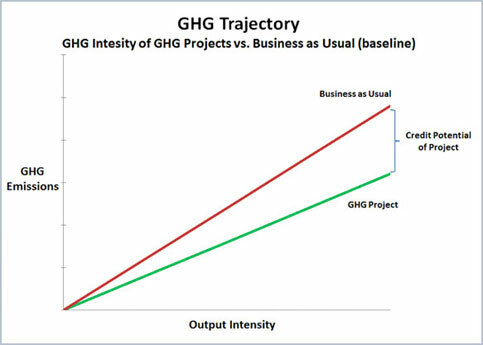 Conservative consideration and selection of functionally equivalent baseline and project conditions is a key factor in developing GHG projects. There are many methods that can be used to determine additionality, baseline conditions and functional equivalence for GHG Projects. Though the GHG Emissions Reductions Registry does not prescribe methods to be utilized, it is imperative that registered GHG Projects clearly identify the how the project has made reductions that would not been achieved under the Business As Usual (BAU) condition. Voluntary - Projects may only be registered for actions that are not required by law. Recent - Are based upon changes made since January 1, 2002. Have a defined crediting period. Standard crediting periods are from 7 to 10 years based upon the changes that were made. Project with longer crediting periods must clearly define the duration and the rational for extended crediting durations. Projects that wish to extend beyond the initial crediting duration must clearly address additionally. Ex-poste Reductions/Removals - Projects may be registered for actions underway or soon to be underway. However, reductions are created on the registry after reductions or removals have occurred. Absolute - Project reductions must be clearly defined in the volume of emissions from each vintage year and do not create a reconfiguration of GHG emissions elsewhere (No GHG "shifting"). Auditable - Records kept and maintained must be accurate and contain enough information in order for third party verifiers to assess and confirm that the reductions or removals of Greenhouse Gasses can be proven to have occurred. Registered - The voluntary GHG project has been registered and that the volume and vintage of each metric tonne has occurred. Additional - All projects must be voluntary and go beyond "business as usual" practices in order to generate registered offsets. Projects should be assessed using a standardized framework when assessing additionality, such as the CDM Additionality Tool. Geographically Defined Boundaries - Physical Location of the site/sites where emissions are avoided or removed must be clearly identified for each site included in the project. Consistent with, and conformance to, Principles taken from ISO 14064-2:2006, clause 3. Relevance - Select the GHG sources, GHG sinks, GHG reservoirs, data and methodologies appropriate to the needs of the intended user. Completness - Include all relevant GHG emissions and removals. Include all relevant information to support criteria and procedures. Consistency - Enable meaningful comparisons in GHG-related information. Accuracy - Reduce bias and uncertainties as far as is practical. Transparency - Disclose sufficient and appropriate GHG-related information to allow intended users to make decisions with reasonable confidence. Conversation - Use conservative assumptions, values and procedures to ensure that net GHG emission reductions or removals are not overestimated. Note - Accuracy should be pursued as far as possible, but the hypothetical nature of baselines, the high cost of monitoring of some types of GHG emissions and removals, and other limitations make accuracy difficult to attain in many cases. In these cases, conservativeness may serve as a moderator to accuracy in order to maintain the credibility of project GHG quantification. It might seem that greenhouse gas (GHG) emissions should be of greater concern to a larger industrial entity than to a smaller office. But the reality is that even if they have not already taken action, all organizations need to understand their carbon risks – and opportunities. Whatever your size, operations or emissions, consider that – beyond the regulators – your customers (whether consumers or other businesses), shareholders and the financial markets may demand action: specifically concrete steps to quantify, disclose and control your carbon footprint. A "carbon footprint" is the quantity of GHG emissions resulting from a process/activity, as well as indirectly from an organization’s supply chain. There are many things you can do to reduce your carbon footprint such as using renewable energy to promote energy conservation with your employees. By managing your carbon footprint, you will be reducing risk, not to mention potentially saving money, increasing the efficiency of your operations and boosting your reputation as a more environmentally friendly organization.